Apart from a couple of foxes north of Gingin we didn't see much road kill as we headed up the Brand Hwy towards Geraldton. There had been a fair amount of rain and rough weather and the roos had apparently decided there was no need or sense to be abroad. I did see an emu, somewhere between Badgingarra and Eneabba. It was minding its own business a few hundred metres off the road, on a slope covered with mallee heath interspersed with grass-trees. You don't want to hit an emu. It's a four hour drive to Geraldton from Perth. At Eneabba, 280 km up the road, we stopped to change drivers. 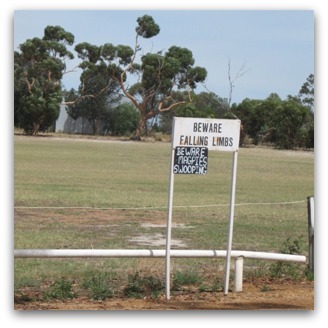 Like most small settlements along major highways, Eneabba is now bypassed. The traveller must enter by a side road, 300 m down which is the Shell roadhouse and a rest area. Most visitors are unlikely to have reason to go beyond that point. They may glance at the nearest dwellings, veiled by the low trees, but they are not going to see the general store, tavern, school, nine-hole golf course or swimming pool. Some West Australian travellers (but few from the eastern states) may have heard that the nearby mineral sands mine was recently moth-balled. If they have, they probably don't remember the details. With all that's going on in mining these days, it was hardly news. At the right time of the year Eneabba is the gateway to one of Western Australia's best wildflower displays. But I was there a few weeks too early and had to content myself with filling my lungs with the fresh air blowing in from the south-west across the coastal heath. The winds are strong on the Batavia coast. They created the famous leaning trees up the road at Greenough. They power a 90 MW wind farm on the rise behind Walkaway — Randolph Stow's Haunted Land — and an 80 MW one at Emu Downs, about 70 km south of Eneabba. The Eneabba rest area is directly across the road from the roadhouse forecourt. It offers toilets, picnic pavilions and a large Information Bay map (You are HERE) — a place to have a piss and stretch the legs. This all backs onto the sports oval, on the other side of which runs the Brand Hwy with its steady shrushing drone of road-trains, campervans and big Four Wheel Drives towing big Recreational Boats. At either end of the rest area, behind the toilets and the map, are a few gnarled eucalypts, about ten metres tall. These stands of trees are about 100 m apart. There are no other trees in the space between them and — with the car park, road and servo forecourt behind, and the oval in front — you stand in a very open space beneath the deep blue of the mid-West coast sky. Yet there, on a two metre post, is a painted sign: Beware Falling Limbs. Attached, hanging below the official one and taped to the post, is another notice, hand-printed: Beware Magpies Swooping. The nearest trees are 50 m away. Phantom limbs? The mystery had me consulting Google Earth's Street Search, which photographed the place about three years before our visit. The image shows a large dead tree close to where the picnic pavilions have since been erected, in the approximate spot now occupied by the sign. Presumably, people were parking near the skeletal tree in order to catch whatever scant shade it afforded on sweltering afternoons. And, perhaps, someone (or their 4WD) took a hit and the Shire received a nasty letter. Anyway, the 'You have been warned, so don't sue us' notice was put in place. But the sign did not disappear with the dead tree. Maybe the workers charged with cutting down the tree had no instructions to also remove the sign. On that sunny day, I saw a bus load of Irish backpackers fresh from or waiting their turn for the toilet, lining up beneath the pristine vault of heaven with their mobile phones to capture an image of those signs in all their splendid detachment. Somehow they have become a tourist attraction, an image to be recorded, twinkled around the world and archived on some website. The State Government recently gave approval for the Aviva Corporation to build a 400–450 MW coal-fired power-station at Coolimba, 15 km south-west of Eneabba. It will be, according to environmental groups, one of the dirtiest power stations in Australia. Aviva maintains it will be 'carbon capture ready'; there are 'plans to phase in' carbon capture and sequestration 'as a separate project when feasible'. When feasible. As things now stand, when the station is commissioned in three or four years' time, it will pump out about four million tonnes of CO2 per annum for 30 years, because 'there remains a lot of work to do to identify and secure the sequestration sites'. Coolimba will produce the same amount (perhaps a little more) of carbon emissions as Hazelwood, the station the Victorian Government wishes to close. An EPA recommendation for Coolimba's stack emissions to meet European standards was overruled by Western Australia's Environment Minister, Donna Faragher. Instead, sulphur emissions will be managed 'to meet regional airshed requirements' — that is, sulphur blowing in the wind. For the next 30 years. An Aviva website assures us 'prevailing winds will favour non populated areas to the east and west of the Project area'. So where does that leave the marine life to the west, the flora and fauna to the east, that emu I saw, and all those magpies a-swooping? H. A. Willis is a book editor and archival researcher who lives in Western Australia. Thanks for this, Mr Willis. If i was a Council worker, and I had instructions to remove a dead tree, and no instructions to remove a warning sign, I would adhere strictly to my instructions. After all, that there is no dead tree in the vicinity is no excuse for not being alert to dangers that falling branches present. (I still have the "Alert, not Alarmed" phone number magnetically attached to my fridge). Carbon Dioxide is not dirty. Is coal called dirty because it's black? It's safe and clean. The only other option is nuclear, but greenies don't seem to like nuclear. Those wind mills you saw are producing more greenhouse gases from diesel backups due to instability they cause to the grid.. but i'm sure you've researched this already? I'm into reducing emissions and not throwing words around like "dirty" and "black" that help no-one solve anything. Your article seems to speak to those who know no details of how electricity is produced. Donna Faragher is Western Australia's Environment Minister no more. I believe she became pregnant with child and concluded her service, as such. Politicians may come and politicians may go, but they can do so much damage in between. Sometimes I feel our politicians are trying to win the Nobel price for Stupidity. For example our CSIRO developed some of the worlds leading Ceramic Fuel Cell technology enables the production of electricity from gas with an efficiency of over 60%. Whilst countries like Germany and Britain support this technology with incentives, here in Australia we have our political Einstein’s trying to turn the clock back to the 1950th by building coal power station with about 25 to 30% energy efficiency.